FOOTBALL KICKING HOLDER COLOSSUS | Ultimate Kicking Holder! 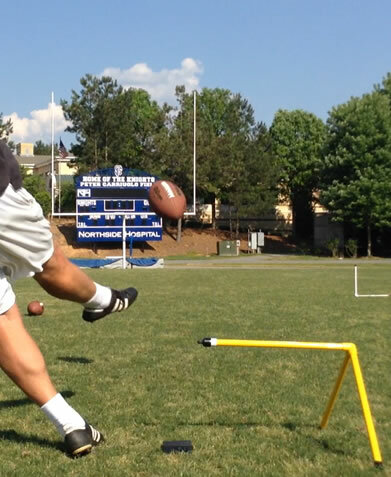 Kickers often train (mostly do train) on their own. This means (for new parents) buying something to ‘hold’ the football during practice when practicing field goals. 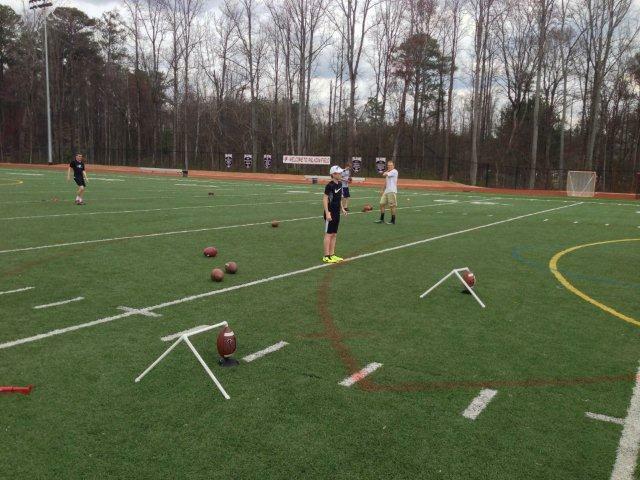 One of the main tools we as kickers use with every practice session is what is known as the field goal kicking holder or football kicking holder. Again, since kickers generally practice their kicks without a teammate holding the football for them, a kicking holder is absolutely critical to use. Now, before the age of the ‘commercially mass produced’ football kicking holder industry, I used to make my own kicking holders out of PVC from the hardware store. Those holders were better than nothing at the time…certainly better than the limited options on the market back then. I remember one commercial holder design I used to see at kicking camps during the summer. It was essentially a large, rectangular iron base (that weighed a ton.) It was the first metal holder I’d ever seen and it had a flexible arm with a cutout foam block attached to hold the ball in place. It had a large screw to hold the flexible tubing in place that became loose over a few months so we just stopped using that model because on top of everything else, it was expensive to a pain to keep updated with replacement parts! That holder was a bit too cumbersome to carry around for me, so I made my own out of PVC. The PVC version was lightweight, easy to transport and most importantly, it NEVER BROKE or wore out because it was PVC. Now, I did have to make more over the years after leaving one or two on a field or flat out losing them, but never because they broke….they were indestructible. Commercial holders, mass market holders…they’ve come a long way. No longer are they big and bulky. In fact, it seems most manufacturers go to great lengths to make these metal rods bend in so many places that sometimes you can practically fit in your pocket. But, a kicking holder doesn’t need to go in my pocket. It just needs to fit in my kicking bag. The main thing I STILL want after all these years is a holder that is lightweight and doesn’t break or wear down easily. All of the joints introduced on the metal holder designs often cause more headache than add any portability benefit I see. Of course, the commercial holders are very popular and very visible thanks to mass distribution channels and marketing dollars. Just look on Google search results for ‘football kicking holder’ for instance….they are front and center 24/7. The major problem as many kickers have come to find out, is that metal football holders are not made to last. This is not my opinion, it’s a logical design flaw if you use one long enough. This is really not rocket science or a product smear campaign on my part. They just have too many points of failure from the hinges to the weld points…too many ways to fall apart or wear down potentially. Watching kickers struggle with expensive metal kicking holder designs that seemed to cause more frustration many times (wear down, become loose, fall apart, break in half, etc) rather than simply hold the football for students, we couldn’t resist designing and building the COLOSSUS football kicking holder for football kicking. This is ‘weighing’ on me too…. 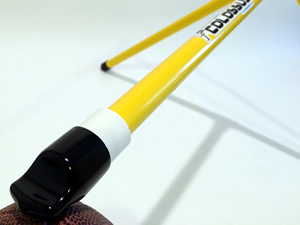 While metal holders often rely more on the weight of a heavier metal arm to put downward pressure on the ball, the COLOSSUS Kicking Holder design utilizes the unique shape of the tough, vinyl tip to keep the ball in place, just the way a ‘real’ holder would apply as little pressure as possible with his finger. Our first run at a design was actually a little ‘too light’ on the hold in an effort to simulate a live human touch. We changed the shape of the holding tip to the flat one we use today and it has worked very well. Since I use our holder (duh) to kick with students on a regular basis, I know from personal experience. Colossus has quickly proven to be very popular while STILL one of the least expensive holders on the market. It may just be the last football kicking holder you ever need! Consider this, we offer our holder for under $30 WITH FREE SHIPPING now. After two years of Priority only, we repackaged the holder (from a bulky box to a lightweight black shipping bag) to ship first class. So, price is important and we don’t feel you should pay $40-$50 or more to buy and ship a kicking holder. 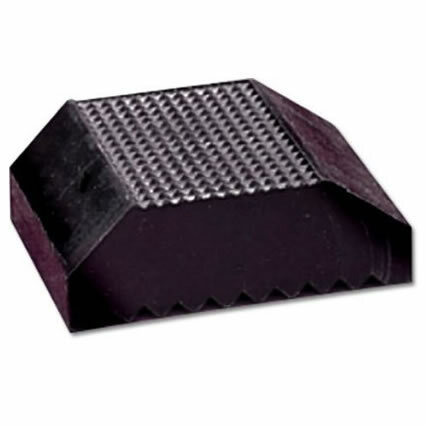 If you are looking for a lightweight, durable football kicking holder that will last you for years (and is highly economical), give our design a try. 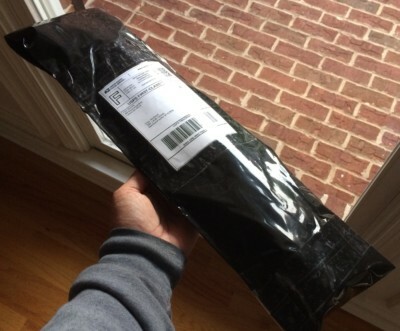 If you don’t like it, ship it back for a refund. As long time kickers at all levels up to and in the NFL, we’ve tried our fair share of commercial football kicking holder designs over the years. Some were too heavy, some fell apart too quickly, some were difficult to adjust, you name it, we’ve seen too many kicking holders that left us wondering why there wasn’t something better on the market. We decided to take our favorite simple, lightweight product and redesign for students looking for a football holder that we could truly be comfortable recommending. The result is our Colossus Kicking Holder. We use this holder personally and in clinics and lessons. One of the very first things most young kickers buy when getting started is a football. The second is a football holder, otherwise known as a ‘kicking holder’ or the ‘football holder’. The football holder aka kicking holder does just what it says…it holds the football in place to simulate a human football holder since most of us are not fortunate enough to have a live person with us during many kicking practice sessions. It’s also one of the most popular pieces of equipment I am asked about from all levels of kickers. I’ve kicked footballs for longer than I care to admit these days and I’ve used many, many holders since the 1980’s (ouch). I’ve probably tried them all at this point, and have designed several variations of my own over the years. These homemade designs were always a bit rough around the edges (literally), and although they could get the job done, I was never satisfied with the way they held a ball on a windy day. A few years ago, I decided to build a few extra holders for our kicking clinic students. I didn’t have enough time to cut the legs, so I just left them a bit long. At the clinic that day, Scott and I laughed a bit about the size of the holder. We jokingly referred to them as the ‘colossus’ design. However, when we began kicking with the super sized design, it was obvious that the larger size (while remaining as lightweight as the smaller design) was much more stable that windy day. We noticed that the students were choosing to use the larger holder over the metal ones that they had brought along with them. It was also obvious that day that we’d created a monster kicking holder design that would one day be available for anyone online. Metal holders are popular today. After all, they are made in various creative ways to collapse for portability. Please keep in mind that my experience is my experience with these holders. I’m not advocating (no matter how it sounds to the makers of these holders) that just because one breaks they all break. I’m simply pointing out some design flaws that we purposely omitted BECAUSE they broke or wore out, etc. Some metal holders use attachment methods like small spot welds to hold the kicking arm at the base which can easily fail when faulty or over flexed. Though metal holders have proven to be popular over the years, these potential issues can, and have, surfaced multiple times during our clinics and lessons. The potential issues below are exactly why we’ve always made our own designs and why so many have chosen COLOSSUS over the past years. I no longer show pictures of these design failures at the request of the manufacturer of one particular holder. However, I do think it’s fair to share what I’ve seen happen with these holders. I’m not in the kicking holder business other than to offer an alternative for those who would prefer our design. I’m in the business of teaching and sharing my experience on my own personal blog articles, so here is my experience in as generic a way as I can describe. METAL HOLDER DESIGN #1: The first design, an all red metal holder with three small folding legs at the base, can be extremely frustrating once the hinges become loose. I watched one student struggle for 30 seconds to get his to work before I stepped in to try the set-up myself. After just a few seconds, I was ready to throw thing off the field. The hinges on the folding legs of the holder had become so loose, it was nearly impossible to move the holder without the legs wobbling and caving in on themselves. Once I had the legs in place, things actually got worse. The hinge on the holding arm had such a looseness of ‘play’ (moving back and forth) that it wouldn’t allow me to keep the ball at the angle I wanted. As soon as I had the football in place with the holder, the arm would move and the football would fall forward or backwards away from my ideal placement. Issues on this holder were primarily the hinges used both on the legs as well as the base of the holding arm itself. I’m sure this design was okay for a while out of the box, but many of the students I saw using it had owned the holder long enough that the legs were flopping around like a small three legged Octopus. METAL HOLDER DESIGN #2: Another popular all metal holder I’ve seen on the market is red and white. I don’t own this one either, but I see this model all over the place. Sometimes, the thin red legs have warped or curved into the shape of a bow which makes the holder shorter than originally intended or even slightly lopsided when one leg’s warp is more severe than the other. My first experience with this one was during a summertime private kicking lesson. After my third demo kick using my student’s holder, the arm flew off and landed in the grass about 10 feet away. This design has a small spot weld at the base of the long, round metal arm (I mentioned earlier in this post). I was disappointed to see that this small weld was all that kept the white arm attached to the top of the legs. I told the student’s father that I would reimburse him for the faulty holder. He shook his head and told me he’d paid over $40 for this device. Not long after that, another private lesson student experienced the same fate with this SAME red/white design. This time, the student himself broke the arm off the kicking holder just by kicking a few practice kicks. I had just been telling that student about the other holder I had broken and why I would no longer kick with student’s kicking holders….too funny. The next lesson I had with the student, his father had taken the holder to a welder for repairs so he could continue using it. I have personally witnessed complete breakdowns of the top two metal based, commercial kicking holders on the market. Another new player in the market is frankly too new for much comment on durability on my part though it is not well designed in terms of weight distribution, etc. I am more convinced than ever that our lightweight, weatherproof “weld-less” design is simple and very effective. Needless to say, it’s fair to say that one reason our COLOSSUS kicking holder came to life was the result of the frustrations I’ve described with these other holders. I swore off the ‘traditional metal holders’ that summer and won’t kick with a metal holder anymore. We are very pleased with our second generation Colossus and it’s unique football holding point and lightweight durable design. We hope you will enjoy using it as well. KICKING HOLDER CHECKLIST – WHY USE COLOSSUS? 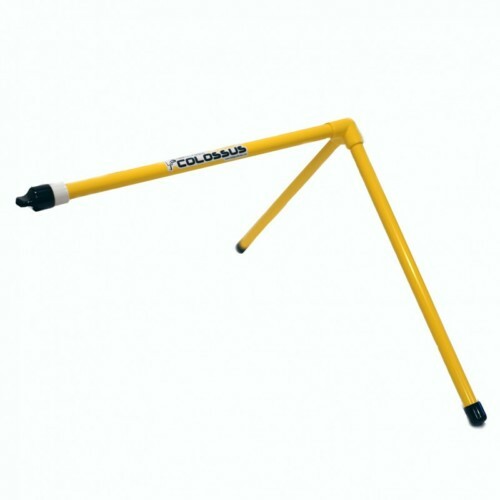 It’s the lightest field goal holder on the market today. At only 12 ounces, say goodbye to bulky holders in your bag! Traditional metal football kicking holder designs, even the ‘lightest’ ones on the market today often rely more on the weight of the arm to hold the ball in place. This puts more pressure ‘down’ on the ball as it’s being kicked. COLOSSUS uses a special notched, wider contact point with extra surface area to hold the ball in place with less weight in the arm, resulting in a more efficient hold with minimal resistance at impact. COLOSSUS kicking holder quickly disassembles into three simple pieces to easily fit into your kicking bag. There are no moving parts to break or fail with time. There are no welded parts, no hinges or joints to become loose. The COLOSSUS football kicking holder is made of thick but lightweight materials that can handle weather with no risk of rust. Contact points are made of tough vinyl, not soft rubber. As lightweight as COLOSSUS is, its wide base is optimal to stand steady in windy conditions. Tough vinyl caps on the feet grip the turf or grass no matter the conditions. There are no squeaky or loose legs to unfold, simply pop in two legs and go. Get the perfect lean for each kick, every time. The shape is solid so adjusting the tilt of your ball is fast and easy! 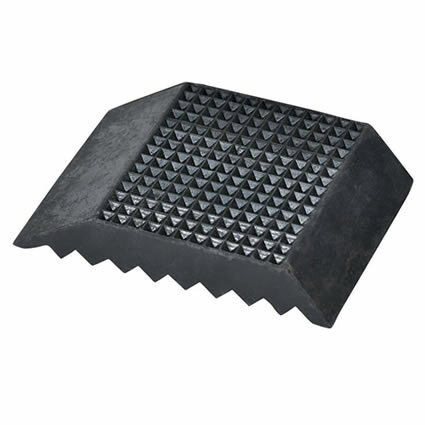 No loose legs folding or flopping, just a rock solid base. Thanks to the flat, ‘fat finger’ design tip, the ball won’t roll out from under the football’s contact point. More surface area on the ball means easier, better holds with minimal movement on windy days. The vinyl surface provides just the right amount of hold without sticking. Even 5 star ratings on traditional metal football kicking holders many times mention that $40 ‘seems pricey’, so we’ve priced COLOSSUS much less. Without specialty moving parts to fail over time, it may just be the only football holder you ever have to buy again!